R1: Ch6, join to form a ring. Ch5, (dc, ch2) in ring 7 times. R2: Do not turn. Sl st in the next ch2 sp. Ch3, 4dc in same sp. 5dc in next ch2 sp. Ch2. (5dc in next two ch2 sps, ch2) 3 times. Join with sl st in top of beg ch3. R3: Ch3, do not turn. *Dc in ea dc across to ch2 sp. (2dc, ch2, 2dc) in corner ch2 sp. Rep from * around. Join with sl st in top of beg ch3. Fasten Off and mark the side facing you as the right side for later reference. Repeat R1-3 for other 8 motifs. using white to join, sl st corresponding sts tog through the Back Loops Only. R1: With Right Sides facing, using White, join with sl st in any corner. Ch3, (dc, ch2, 2dc) in same corner. Dc in ea dc around entire Nine Patch working (2dc, ch2, 2dc) in ea corner. 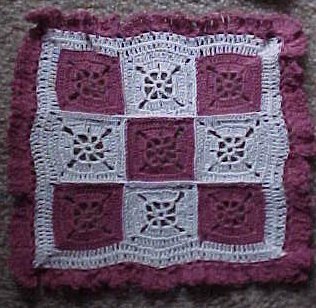 NOTE: Place 1 dc in the unworked corner ch on each motif and place 1dc in ea join seam between motifs. Join with sl st in to pof beg ch3. R2: Do not turn, sl st to next corner ch2 sp. Ch3, (dc, ch2, 2dc) in same sp. Dc bet posts of all dcs along sides. (2dc, ch2, 2dc) in ea rem corner ch sp. R3: Changing to Mauve, join with sl st in any corner ch sp. (Sc, ch2, sc, ch2) in corner sp. Dc in next dc. (Sk next dc, ch2, dc in next dc) across. * [CORNER] (Ch2, sc, ch2, sc, ch2) in corner sp. Rep from * twice more. Ch2, join with sl st in 1st sc made. R4: Do not turn. Sl st in next ch2 sp. Ch4, (tr, ch2, 2tr) in same ch sp. Rep from * around. Join with sl st in top of beg ch4. Blocking and/or stiffening optional with this pattern.